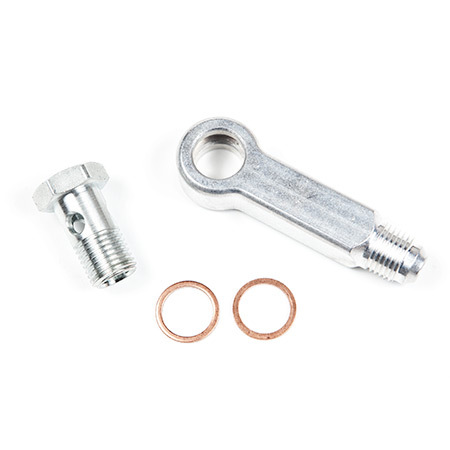 Banjo fitting kit including LONG aluminum banjo; for coolant (water) ports on Garrett ball bearing GT25, GT28, GTX28, GTX29, GT30, GTX30, GT35 and GTX35 series turbochargers. Also compatible with Garrett ball bearing GTW34, GTW36, and GTW38 series turbochargers. Long Aluminum 14mm Banjo to -6AN Male flare.